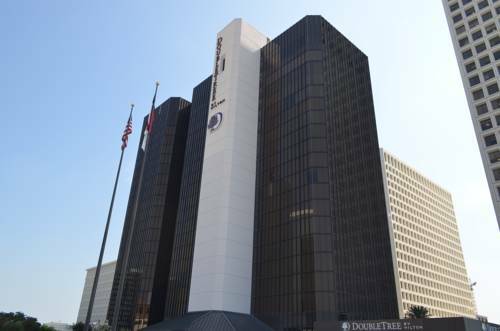 This hotel is 100pct non-smoking Enjoy friendly hospitality upscale guest rooms contemporary facilities and a freshly baked warm chocolate chip cookie upon arrival at DoubleTree by Hilton Hotel Houston-Greenway Plaza. Set in the Greenway Plaza business complex this stylish hotel near the Houston Galleria area offers easy access to many Houston businesses attractions shopping the Houston Medical Center and leisure options. Complimentary transportation is available within a three mile radius of the hotel. All of the spacious club-style guest rooms feature modern amenities and luxurious touches to make you feel at home. Enjoy stunning downtown and River Oaks views through floor-to-ceiling windows and relax in the sumptuous Sweet Dreams by DoubleTree bed. Upgrade to a Corner King or a suite for additional space. With 26 992 sq. ft. of flexible function space and the latest A/V technology this Houston hotel is the perfect place to hold your next business meeting or social event. Our dedicated staff will be on hand to ensure your event is executed perfectly. Stay connected with the complimentary 24-hour business center and complimentary WiFi in all the hotel*s public areas. Read the morning papers over a cup of coffee in the onsite Starbucks savor Texas-inspired specialties in the stylish Bistro 59 or unwind with a cocktail and a selection of lighter dishes in Edloe*s Lounge. Individually brewed just for you Starbucks is located in the main lobby. Delicious coffee and tea beverages pastries and other treats to enjoy at America*s most popular purveyor of specialty coffee creations.